Regional daily editors have been asked to provide staff to fill-in for striking journalists at a group of sister titles, publisher Newsquest has confirmed. National Union of Journalists members working for Newsquest’s South London weeklies are due to walk out for 14 days from Thursday in a dispute over job cuts and workloads. The publisher has confirmed that a memo was issued last week to editors and senior staff at 19 sister dailies to provide names for a rota covering the proposed stoppage at its Sutton hub. However it is understood that while daily newspaper staff have been asked to lend support, they will not be working at Sutton and so will not be crossing the picket line. A Newsquest spokesman said: “We have a contingency plan in place that will ensure our south London publishing plans are not disrupted by any potential industrial action. Daily newspapers which have been asked to provide cover include the Southern Daily Echo, Swindon Advertiser and Oxford Mail. 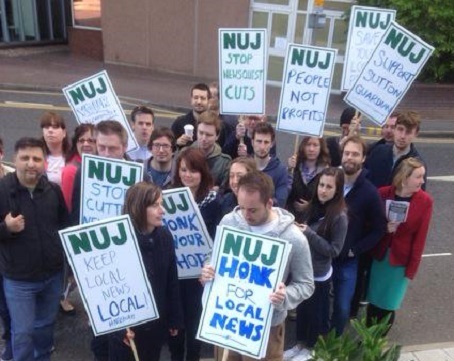 The strike announcement came after the NUJ claimed five staff in South London had resigned since redundancy plans which would see 11 staff cut were revealed. All bar two of the group’s 29 editorial staff were put at risk of redundancy as a result. I didn’t realise Newsquest could sink any lower . . . I can’t see this going down too well in most newsrooms, not least as they’ve been cut to the bone so simply can’t spare the staff. Does anyone know if seconded staff are allowed to refuse the scab gig? If the daily staff are in the union i presume they could refuse. Almost certainly not. Modern contracts of employment oblige you to work anywhere and at any time your employer tells you to. And, union member or not, how many young reporters these days are paid enough to take the risk? And I bet they can easily find enough union haters – twas ever thus in newsrooms! And here we are again – full circle back to the days when some of our brethren feared for their jobs, others happily brown-nosed editors on their upward career paths while the rest of us tried to negotiate for better pay and conditions. Now thanks to anti-union legislation, greed and our own timidity, employment contracts will stifle any collective action.